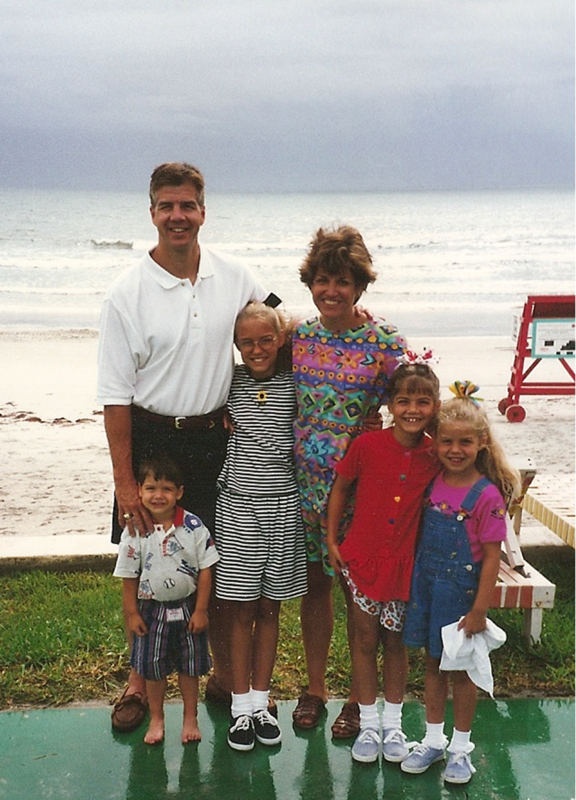 One of our family vacations…everyone is smiling! Wow…look at the outfit I have on…times change! The plane has landed or the car has come to a stop…you have finally arrived at your destination! You want your family to enjoy every minute, so what is first? Remember how I said vacation is a mindset? Well that should be a parent’s mantra while on vacation, be in the vacation mindset. I know a lot of parents say to me, why would I want to pack up all of my child’s things, drive or fly several hours, and then do the exact same thing at my vacation destination as I do at home? My job does not change! While on vacation parents still change diapers, feed or nurse the baby, deal with tantrums, try to get naps in, and even plan meals and cook if they are staying in a place with a kitchenette! Yes, that is true, but you have a change of pace, a change of place, and undivided time together as a family. Family vacations ARE different from vacations as a couple, but they are moments in time that families treasure forever. So, get in the vacation mindset and enjoy being away, it is not about how much you DO but the time you spend together. Here are some tips to make that time away feel like a vacation! Wake a sleeping child a few minutes before arriving at your vacation destination. This will usually prevent a meltdown when you are transitioning from the car or the plane. Do not expect too much of your child (or yourself), especially the first day of vacation! Take a day to unwind, unpack, and breathe. Don’t jump right into “vacation fun” and lots of activities. Do not over schedule your vacation. Try just one big activity a day. That is about all your child and you can handle. Be sure to have down time. Plan a flexible itinerary. Be willing to cancel plans if your child is just not enjoying the activity. Try to keep your at home meal and sleep schedule as much as possible. Things change on vacation, but keeping a little routine prevents tantrums, over tired children and grumpy parents. However, a little later bedtime, a few more snacks, and a little more relaxed routine are part of vacation. One week will not change your home routine forever; it all can be adjusted back to “normal” once you are home again! Child proof where you are staying. Remember that you are not home, and there may be dangers in your home away from home. Bring painter’s tape and twist ties. Tape over outlets, tie up blind cords and electrical cords, put up any poisonous items, move sharp-edged coffee tables etc. Take a look under furniture and around on the floor to be sure no loose pills, change, or other choking hazards have been accidentally left by the cleaning crew! Wipe the phone and remote control with antibacterial wipes. If you are on an upper floor with a balcony, be sure that the door to the balcony has a child proof lock or block the door so little ones don’t wander out on the balcony without an adult. Put your night-light out so you can see to check on your children at night and/or your toddler or preschooler feels a little more comfortable in a different bed. Check out where the nearest ER is located. Not to be a Debbie Downer, but occasionally there is a split chin or an ill child on vacation. Much better to know where you are going BEFORE you need to know! Unpack and get settled. Make a list for your Target or Wal-mart run to pick up those extra diapers or food that you will need. You will feel like “vacationing” after you have what everyone needs. Take a deep breath and think about your days ahead, don’t dive into vacation overdrive! If possible, having a kitchenette often makes life much easier when traveling with children. This allows you to keep your child on some sort of schedule and eating foods that are familiar. It is fun to eat out too! Be sure that your restaurant destinations are kid friendly and you are eating early. Not many young children can wait until late to eat without a meltdown! Hang out with the over 65 crowd and get those Early Bird Specials! Tips for your child and you! Make sure that you bring your child’s lovey. He or she may need it more in a new environment. Start and end your day early. This is not about sleeping in or staying out late. Young children are at their best earlier in the day. Respect your baby’s inner clock will make the day better. Remember late afternoons should be quiet time. Stay close to home base-Your child’s mood may be more unpredictable than usual—so stay close to here you can return easily. Short jaunts away are less likely to tax your child’s patience. Schedule move time. Most toddlers need to be let loose, and infants need to be put on a blanket to stretch. New walkers and crawlers especially hate to be confined. Spend time every day at a park, playground, mall, any place you can let your child move. Expect the adjustment to take a few days. Toddlers and older infants will cling to you more than usual and may be fussier than normal. You are your child’s best security blanket. Trade off between parents. It is your vacation too! One morning Mom sleeps in, one morning Dad does. Allow each other to take a break and have alone time. If you are vacationing with family, ask for one night out. Go for a walk or an early dinner while the kids stay with family. Relax and enjoy the change in environment…different is good! So enjoy that family vacation, document it with many pictures, and tuck those memories away. Some how it IS different when you are away, even if you are still changing diapers and dealing with fussiness. Those vacation memories will be treasured by you and your children. Enjoy. ← Surviving the airport with children! What great memories of vacations with our family! Love this!! Work to get ready but many rewards of laughter and fond memories of good times with your family!!! Wonderful memories….ones to sit and enjoy for years to come….